The Island of the Sunless Sea is a BAD TIME and Angharad will NOT be going back. In fact, she would much rather go STRAIGHT TO HELL. GOOD DAY SIR. A chance conversation with the village drunk reveals that, somewhere in the labyrinth, Angharad may discover the path to "the island where angels watch." How Farnham stumbled across such a place is anybody's guess. Probably just an ale-soaked dream. Eleven floors down, Baron Azotunr the Fireeater hauls his luminous bulk as fast as he can in an attempt to catch up our rogue and crush her in his flaming embrace. Unfortunately for him, she happens to know how doors work - and he, apparently, does not. Mysterious lights at the forest's edge, vanishing menfolk, and a worried plea from Gillian the barmaid bring Angharad face-to-face with Andariel, Maiden of Anguish. Her victims were past saving, but the temptress will lure no more men to their deaths. No? Okay. Cool. That's fine. This is fine. Returning to the material plane, Angharad leaves the catacombs behind and descends into a network of vast natural caverns, great open chambers of earth lit by rivers of glowing magma. It's hot down here. Our gracious host reveals himself at last! At least, he reveals himself long enough to cast a few fireballs, open a portal to bring in his goons, and teleport away. If he had any sense, he'd port himself right over to the next dimension and stay there. Well now, I guess Grimspike needs to get down to his local civil service office, and get started on the paperwork to change his legal name to Pincushion Greenslag. Hope he knows where he put his social security card. But wait...who the hell is laughing? Okay maybe this was a bad idea. Well, well, well. Our bold spell-spinner actually caught the lieutenant of Belial in one of his webs. Angharad didn't come here to take on Grimspike, but something tells her that the planes will be better off if somebody puts an arrow between his horns. Descending into the pit that somehow lies "below" the astral prison, Angharad confronts Doomlock. The demon's teleportation and lightning attacks render him fearsome indeed, but the rogue triumphs in the end. What else do you have down here, Horazon? Naturally, like every other robed fool who ever etched a summoning circle, our man Horazon has landed a fish too big to gut. So now it's the job of one feisty rogue to clean up his mess. Magic problems, steel solutions - what else is new? The prison plane of Horazon is teeming with formidable threats, not least of which is the malevolent architecture itself. Flames shoot out from jets in the floor, floating orbs fire lightning bolts, and one false step could plunge into the abyss. The magic of the summoning circle spirits Angharad away to a distant plane, a cosmic prison adrift in the void. Before her, a network of stone platforms hangs suspended in the blackness of space, lit by the cold glitter of the numberless stars. Eight floors down, an incantation in an ancient tongue reveals a secret arcane circle - and a warning. Horazon, master of the disciplines that summon and bind, promises death to those who cross the border between worlds. So, of course, we step right in. Retreating to the surface, Angharad discovers that one of the treasures she retrieved from below is a mystic amulet imbued with light, an anodyne against the gloom. As the light gains purchase, her spirits are lifted, her purpose made clear. The Hidden stalk the Halls of the Blind, demons of the ether who walk unseen, manifesting in the mortal world only in the instant when they strike. Cunning, yes, but a Sister of the Sightless Eye hunts by scent, by feel, by instinct. Beyond the Hall of Heroes lies the Chamber of Bone. Treasures glitter within, guarded by the fallen. A *lot* of the fallen. Bad place for your bow to break. Shouldn’t have skipped a visit to Griswold. A mysterious illness, strange sounds, and a sickly sweet smell lead Angharad to investigate the cellars below one of the houses in town. There she discovers a brood of monstrous wyrms. She destroys the infestation, but cannot save the fruit preserves. Beyond the Gateway of Blood and past the Hall of Fire, a Risen Hero steps forth to test the mettle of our bold rogue. By her victory, Angharad proves her right to wear the blessed mail known as Arkaine's Valor. Could she be the fabled Hero of Light? Five floors down, the decor changes, and not for the better. Chapels and alcoves give way to sepulchers and catacombs, brick and mortar to earth and stone. The shadows press in on Angharad, and the smell of death surrounds her. In an act of shocking betrayal, Gharbad turns on our heroine as soon as the promised work is done. Poor, stupid goat-man gets himself killed over a "magic" buckler worth 500 gp. Angharad is not impressed. 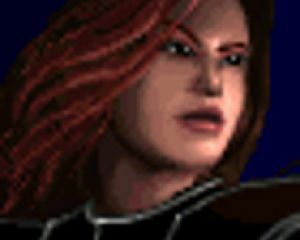 A screenshot blog of the adventures of Angharad - lovable rogue, eternal hero, forever reborn.